2011 NPC Team Universe Bodybuilding, Figure, Bikini, Men’s Physique, and Women’s Physique Championships & 2011 NPC National Fitness Championships! Upcoming weekend bring us an important event that will take place in Teaneck, New Jersey. The 2011 NPC Team Universe Bodybuilding, Figure, Bikini, Men’s Physique, and Women’s Physique Championships in conjunction with the NPC National Fitness Championships will open its door for over 400 competitors on July 8-9. 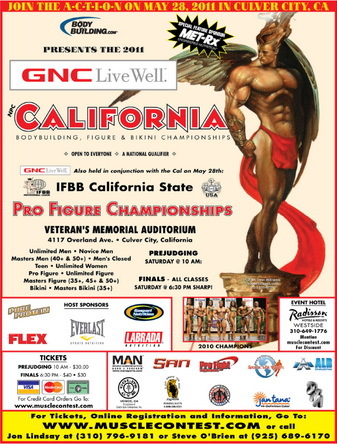 The show will start on Friday at … Read more2011 NPC Team Universe Bodybuilding, Figure, Bikini, Men’s Physique, and Women’s Physique Championships & 2011 NPC National Fitness Championships! What an incredible weekend in Las Vegas, where 18 competitors earned the right to turn pro in the IFBB. Congratulations! Here are the links to the complete results of the 2010 NPC USA contest.